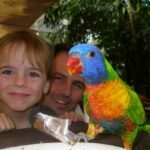 We posted already about our experiences of travelling around Southeast Asia with kids ( for 5 years!) now lets have a look at where you should go in Southeast Asia. What are the stand out, must see places, attractions and destinations. You’re probably in the process of planning your Southeast Asia trip, so I suggest you get a notebook and start listing the places you and your kids, absolutely HAVE to see or visit. Later we can talk about the practicalities of joining your destinations together into an itinerary and organising your travel plans. Could you do me a favour? Tell me in the comments how long you are planning on being in South East Asia for? How much time do you have? If I know what the typical amount of time is, I can help you better. Do not be put off. This isn’t hard. I know new travellers may see Southeast Asia as a whole other world but it’s really not. There is a well worn traveller trail in Southeast Asia and it’s been there for decades. You won’t be breaking any new ground and thousands have gone safely before you, with kids too. Southeast Asia is full of travellers, backpackers and holiday-makers. Arguably too many of them. So lets have a look at some of the places you really should try and see during your precious time in the magical east. Southeast Asia comprises Thailand, Laos, Vietnam, Malaysia, Singapore, Cambodia, Philippines, Indonesia, Myanmar, East Timor and Brunei. 11 Countries or Sovereign States. It is mostly in the Northern Hemisphere but straddles the equator and stretches into the south. India, Sri Lanka, Maldives, Nepal, Bangladesh etc. are not part of Southeast Asia. You can easily combine them with a Southeast Asia trip and you can find information on these countries elsewhere on this site, but this post only deals with Southeast Asia. 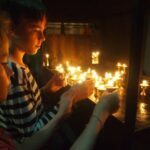 We haven’t been to all of the countries in South East Asia yet but on this website we always go back and add to posts like this, so once we’ve been to East Timor, our first hand experiences will be on this page. For now I asked a few friends to help me with this project. I think this would be really useful for people planning a trip or tour of South East Asia, so we’re going to make one. Time didn’t allow this week, but it’s coming soon and you’ll get it in a weekly newsletter ( sign up in the side bar). Southeast Asia as Adults and With Kids, What’s Different? Every country has kids. Every parent wants to keep their kids safe and happy. You will find playgrounds and kids’ facilities everywhere. 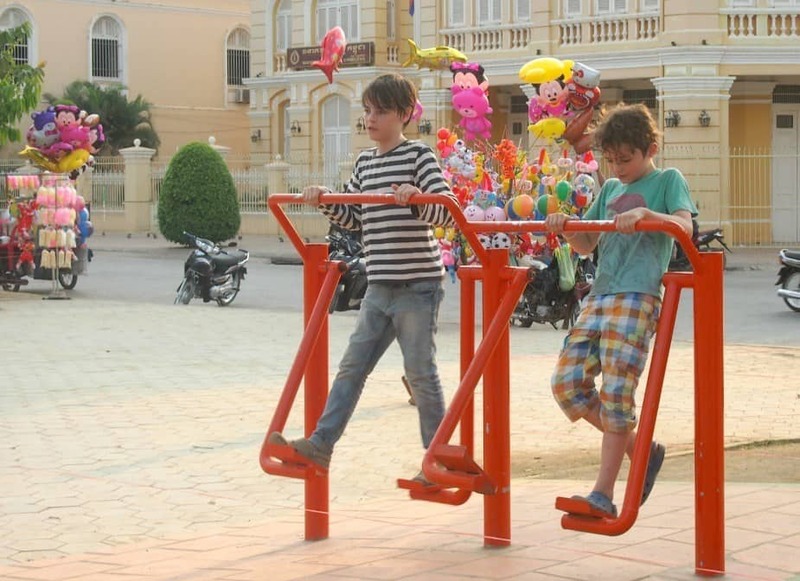 This is Battambang, a small town in Cambodia, with a beautiful river-side playground and exercise area. There were loads of local kids and two western travelling families here on the evening we visited. It will be hot, there will be mosquitos, you won’t be able to drink the water. There is unlikely to be much of a language barrier because tourists and English are common. Standards of transportation and accommodation depend entirely on how much you want to pay and the people will generally be friendly and welcoming. Road and traffic safety may concern you. Will your kids get sick? Well, we found that ours didn’t get sick more-so than anywhere else. But that needs to be a separate post. What will you eat? Pretty much whatever you like, depending on budget. You can get pizza and fries just about anywhere these days. Will you have to use squat toilets? Possibly not, they’re getting rarer and rarer. Will you transition from toilet paper to the ubiquitous bum squirter? I do hope so, it’s so much nicer., but you should manage OK if you keep a roll in your daypack. Again, any questions, put them in the comments. Some of these countries we’ve visited over 20 times, some we’ve lived in for up to 6 months. One or two we’ve never been to, I’ll explain why and call in a few friends to give their first hand perspective. I’ll try and include our thoughts on danger and safety in these SouthEast Asian countries. What I want to do here is give an overview of the highlights you and your kids shouldn’t miss to help you with your planning and start building your excitement up to frenzy level. 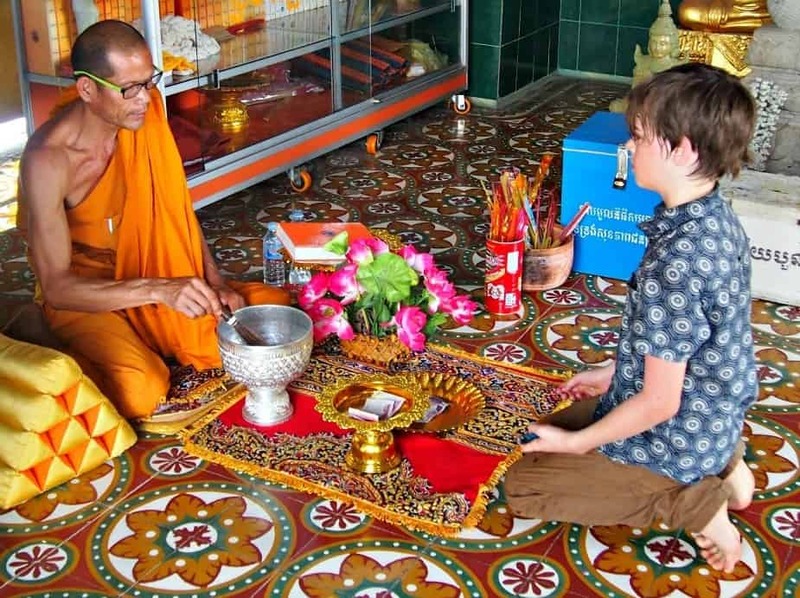 You bet there are heaps of things for kids to do in South East Asia. 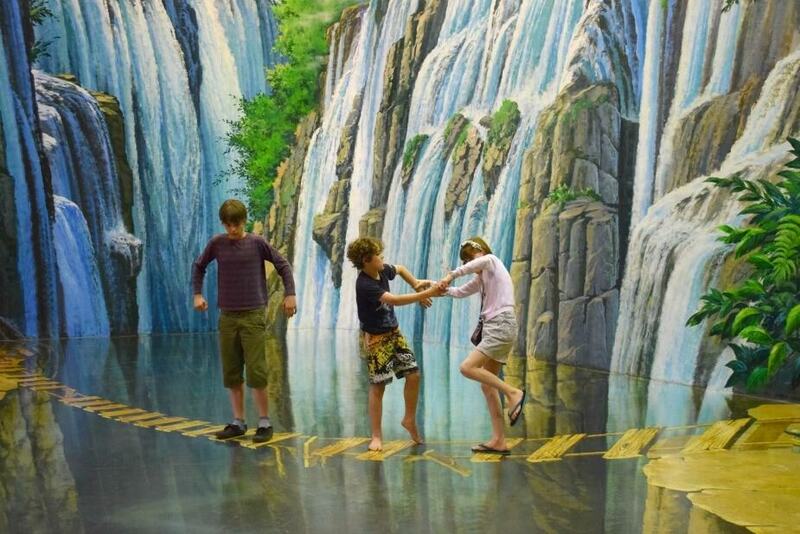 3D art museums are big news in Asia, this one was in Chiang Mai, Thailand. You will find plenty of playgrounds, indoor play facilities, theme parks, child themed tourist attractions and so on throughout Southeast Asia. These aren’t our primary concern here, we’re talking more about the unique features of each country, the things you can only experience in this part of the world. I’ll mention special places that kids love, but I’m not going to list every aquarium, Kidzania and zoo, it’s just not practical. That needs another post! This family room in Sukhothai, Thailand, was a little more than we usually pay but came with a pool and breakfast and was absolutely beautiful. It was well under $100 per night. The lowest we’ve ever gone was $12 per night for 4 people, in Thailand and in Laos. Rooms are sometimes acceptable even at this sort of price. Again, this is a topic for another post. Whether you choose hotels, villas, apartments, hostels, hotels or guest houses is up to you. All can be good depending on your preferred travel style and how much money you choose to spend on this trip. We already have a post highlighting some of our favourite places accross the region. Most of these we’ve used multiple times. The hotel above is Thai Thai Resort in Sukhothai, Thailand and we highly recommend it. If you’re new to big travel adventures maybe sign up for Airbnb ( Use our link for credits against your first booking, here) and Couch Surfing right now, these could come in useful as you start organising your trip in detail. The Supertrees and whole Gardens by the Bay area are very impressive, as is the Marina Bay Sands and whole city skyline behind. I think Singapore most reminds my of Sydney. We enjoyed visiting last year but never included Singapore on our earlier backpacking trips in South East Asia . Singapore is a city experience, rather like Kuala Lumpur, but with a higher price tag. It’s a stunning city and there is something special and unique about this country but it doesn’t have the same vibe as countries like Thailand or Vietnam. Whether that is a good thing or a bad thing is down to your personal taste. We have only visited Singapore once, last year, because honestly, we never had a burning urge to go there. If you do include Singapore on your SE Asia trip, take plenty of cash and keep your visit short. Your money will go further if you spend more time in the cheaper parts of Southeast Asia. 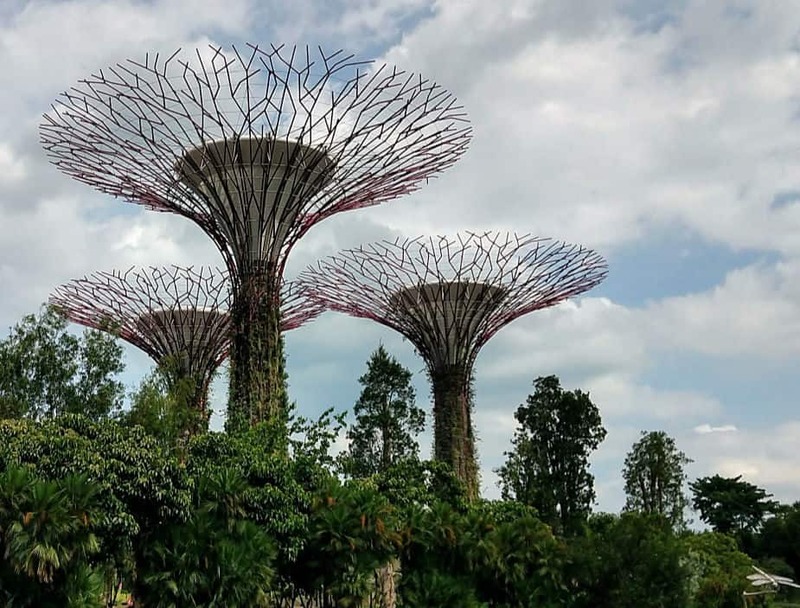 You can see Little India and check out the brightly painted Chinese shop houses and temples or you can marvel at the high rises and super trees of Gardens by the Bay. It’s undoubtedly impressive. We loved taking our kids to Universal Studios, Singapore Night Zoo and SEA Aquarium along with exploring Gardens by The Bay beneath Marina Bay Sands ( the “boat” on a building) and walking along the river from the bay to Clarke Quay. 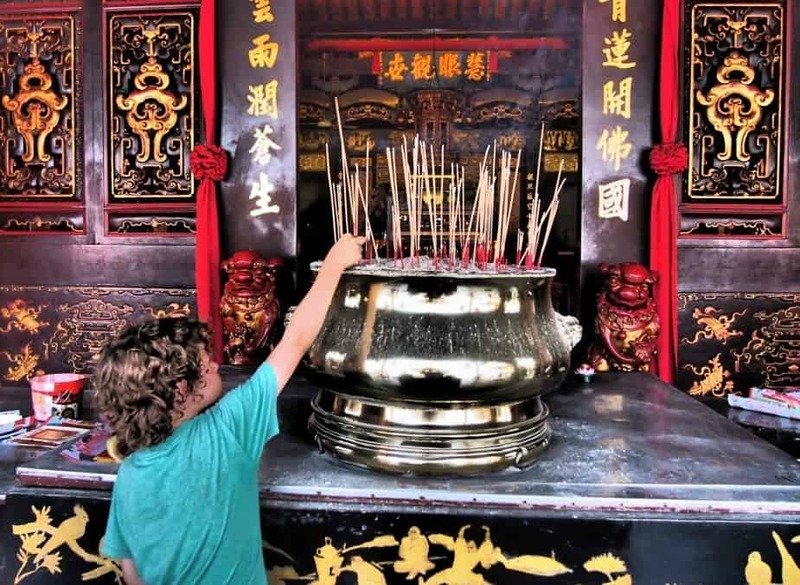 Little India and Chinatown are nice but our favourite spot was Haw Park Villa because it was something different, something we hadn’t experienced before in South East Asia. Sentosa is a pleasure park tourist island just off Singapore and reachable by causeway road or cable car. This is where you’ll find much of the tourist hotel and attraction scene. Prices are sky high here and we stayed here for a few days over Christmas to visit all of the attractions. You’ll find more affordable hostels. hotels and apartments in Singapore proper, we found a hostel with a good location for $80. Our full post on Singapore is here. Malacca’s historic old town blends Chinese, Indian and Malay cultures. It’s a fun, place for kids to explore and enjoy. There is a great, child friendly, museum on shipping and the spice trade in Malacca along with a birds’ nest ( for soup) making museum that kids would enjoy. Malaysia’s big cities are in some ways similar to Singapore, particularly the gleaming high rises and malls of Kuala Lumpur but this much bigger country has more diversity to offer. Kuala Lumpur is a bit of a favourite of ours and you’re extremely likely to spend time here because of AirAsia. It’s nice to take a break in a city with aircon, Marks & Spencer and Gucci now and then and the Petronas Towers are very special, you should take a look. 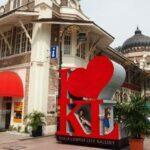 Kuala Lumpur has a whole bunch of things to do with kids or for families. Around the Petronas Towers and KLCC there is an area of parks and water play along with a very good aquarium. Batu Caves is a bus ride from Kuala Lumpur. Check out the malls and visit China Town, the Historic District and Little India. Full post on KL with kids here. One of my very favourite places in the world and it’s spectacular. The Grand Palace in Bangkok. This, to me, is one of the big must-sees in South East Asia, along with Angkor Wat. Now we’re onto our favourite places. I won’t be happy until I’ve seen every inch of Thailand but for now, just a few recommendations. Starting with Bangkok, possibly my favourite city in the world. 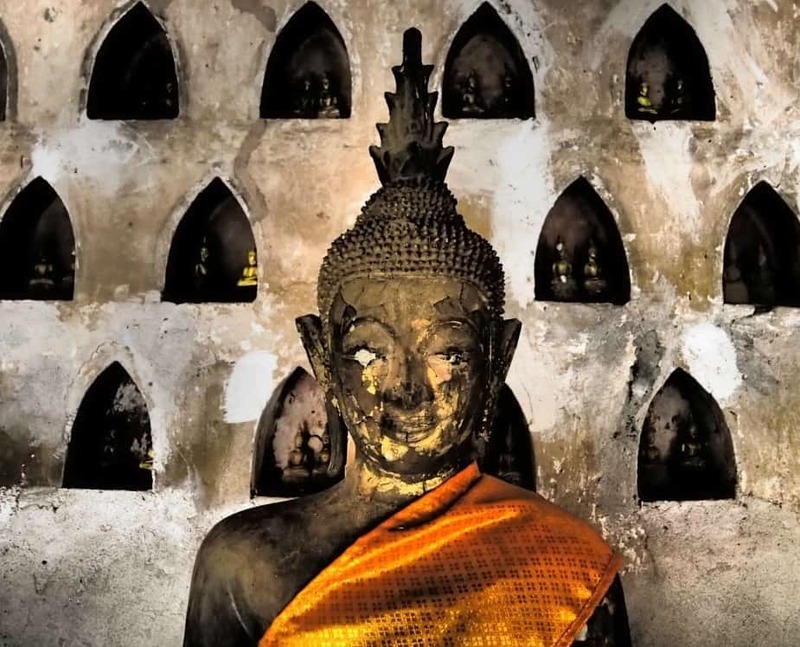 Don’t miss Thailand’s ancient cities of Ayutthaya and Sukhothai,. Chiang Mai, the northern tourist hub, is popular for a reason, it has stunning ancient temples, history and a wealth of things to do nearby. Kanchanaburi is popular for it’s WW2 history, the famous bridge on the River Kwai is here. It’s also a peaceful riverside town with low prices. 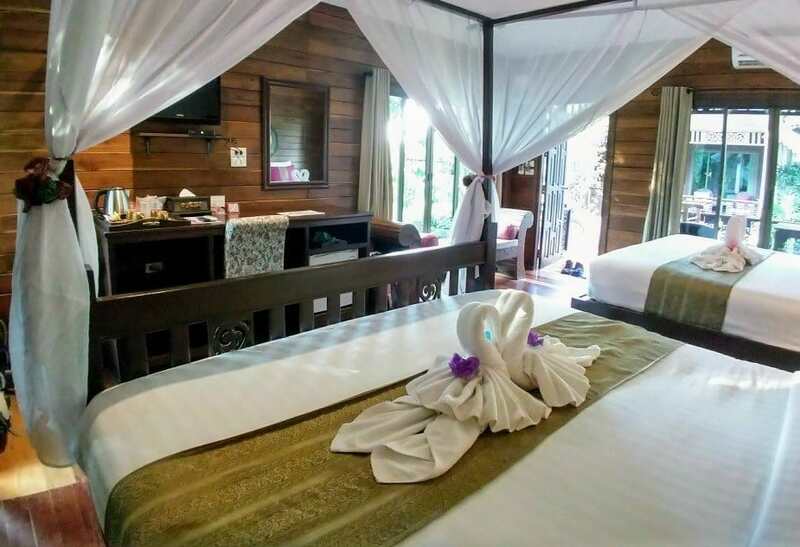 Perfect for long term budget travellers to relax for a while. Floating Markets are popular, we recommend Amphawa over Damnioen Sudawek. What about Thailand’s famous hill tribes? This was my first ever taste of Thailand, a week trekking in the hills and staying in Hill Tribe villages, unforgettable and awe inspiring, you really should try to find out something about these people. We have a full post on Hill Tribes of Thailand here. Best Blog Read Now! 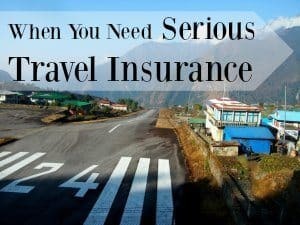 Scared to Travel the World? Did you know that Thailand has almost 300 species of mammals and getting on for 1000 types of bird? But where to see them. We’ve seen a fair few in northern Thailand, out towards Pai and Lod Caves or trekking in the jungle, but I think a very good place to go would be Khao Yai National Park, it’s only 4 hours from Bangkok and this will be the next part of Thailand that we visit! 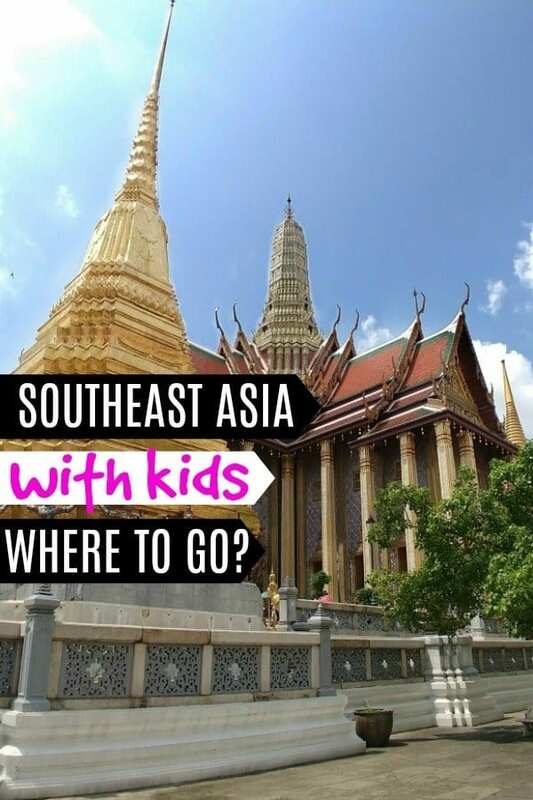 Need More Information on South East Asia With Kids? 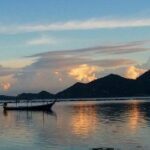 We’ve been creating out South East Asia travel blog for over 6 years now and we have A LOT of content. Try some of these! There are loads more South East Asia posts, find them via categories. Vietnam is long and thin and the standard tourist visa length of 1 month is the perfect amount of time to travel north to south or vice versa, hitting all of the highlights. Vietnam has always been my husband’s favourite country, for the genuine warmth of the people and the amazing food. It’s now the kids’ favourite destination in South East Asia too. We spent 6 months living in Vietnam ( our second visit) in 2017-2018, so we have quite a lot of Vietnam content, mostly revolving around beautiful Hoi An in central Vietnam. 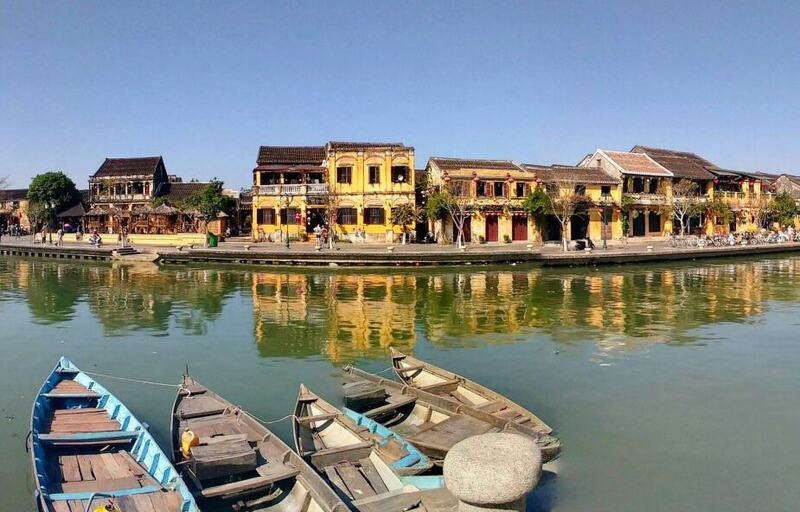 It’s UNESCO listed Old Town is a must-see but its relaxed charm also makes it one of those global hot spots for nomads and travellers putting down temporary roots. Other highlights of Vietnam include those below. There are many more of course. The stuff of dreams! I’m longing to go, for now, I have to call in a friend with 2 weeks in Myanmar with 3 kids under her belt. When we first set off to travel the world in 2012, Myanmar was top of my list of countries to visit. In 2018 we still haven’t been! I long to see this country for myself but it just never fitted with our travel plans and then the genocide last year stopped us visiting. I asked Nicky of Go Live Young about her experiences of Myanmar with 3 kids. 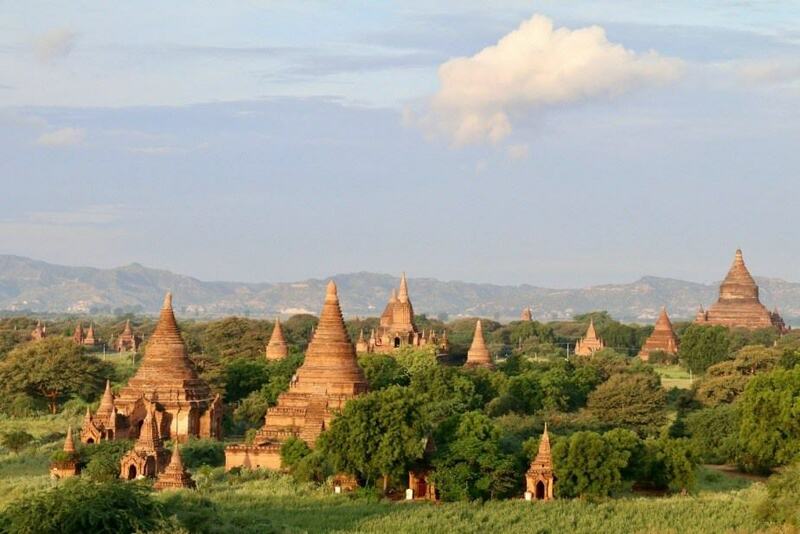 “Myanmar, previously Burma, is the largest but least known country in SE Asia. Having previously experienced tyrannical military leadership the country is changing fast as it opens up but the old Burma is still very much in evidence today. This remains a land of a thousand gilded pagodas and ramshackle towns and villages populated by monks in red robes and locals dressed in sarong-like longyi, and where big named brands are still notably absent. Most visitors begin their travels to Myanmar with Yangon where the Shwedagon Pagoda should not be missed. This gigantic gold stupa is 99 metres high and made from 22,000 gold bars! Inle Lake is another highlight. Take a boat ride to see the Inle Lake fishermen who row with their feet, floating gardens and stilted villages. Bagan is the most famous tourist destination in Myanmar and for good reason, with its thousand of temples blanketing the landscape. Tour the temples by horse and cart, electric moped or bicycle. Mandalay and its four previously royal capital cities is the perfect final destination in Myanmar. A blessing for the kids from a very friendly monk at a temple near Battambang, Cambodia. Battambang has heaps to do, including the famous bamboo railway. Canbodia has Angkor Wat, of course, and every visitor to South East Asia should get there. During our first round the world trip we only spent a week in Cambodia. We crossed by boat and road from Vietnam, spent a couple of days in Phnom Penh then drove to Siem Reap for Angkor Wat before exirting by truck into Thailand. Cambodia is a very different country today and the tourist trail is much wider. Siem Reap for the Angkor complex. Otres Beach and various beach islands off the Cambodian coast. I took this photo inVientianne, Laos. We’ve been twice and spent over a week there with the kids when they were just 6 and 8, I’ve never posted about Laos’s Capitol City. I should. Laos’s 2 big tourist towns are Luang Prabang and Vang Vieng, but don’t skip Vientiane and if you have time, there is much more to see in Laos. In Luang Prabang visit Wat Xieng Thong, one of Laos most famous Buddhist monastries and climb Mount Phu Si which is reached via a 329 step staircase. Outside Luang Prabang you will find waterfalls, caves and elephant attractions. Don’t miss the early morning monks’ alms walk, but show proper respect. In Vientiane see Wat Si Saket, rumoured to be the oldest Wat in Vientiane, see the ” Monster of Concrete” or Victory Monument and visit the COPE visitor centre. The Plain of Jars is a huge area of plains with multiple mysterious huge jars scattered throughout. Vang Vieng was the place for drunken tubing but the Laos government clamped down on this after a series of deaths. You can still go tubing, kayaking or caving but it’s more family friendly these days. I asked Floss of Growing a Pair about her time in Phillipines. Again we haven’t been. We’re not really beach lovers and the food doesn’t entice us there so we’ve never made it a priority to get there. Floss, clearly, loves it and I think we should try and visit Phillipines as part of our next round of travel in South East Asia. The Philippines is an archipelago of over 7,000 different islands with a rich and mixed culture that is very different to anything you’ll find on the Southeast Asian mainland. Stunning beaches and lagoons, breathtaking landscapes, world class wreck diving and friendly people make island hopping here just awesome. Don’t hang around in Manila, unless you love busy and slightly scary cities with traffic congestion and shopping malls (this is the only place I’ve ever been asked to put my gun in a box at the front of a restaurant – it’s poor form to take your gun into a restaurant, obviously). Get on a ferry or a plane to one of the beautiful islands. Coron in Palawan is my favourite and one of the most beautiful places in the world. Hire a bike and cycle to saltwater hot springs, get in a kayak and paddle to your own personal private island (ok, so it’s not actually yours but you can pretend), snorkel on WWII wrecks, or experience the weird halocline in Barracuda Lake (where saltwater meets fresh water – trust me it’s weird). If you’re a qualified diver, Coron is one of the best scuba diving destinations for wreck diving too. East Timor is one half of an island at the sothern tip of the Malay archpelago, the other half belongs to Indonesia. I only know of one travel blogger who has been to East Timor. He doesn’t have kids. You’ll find his insights on travel in East Timor here. It’s not somewhere I’ve ever thought of taking the kids but it’s fascinating to read about this troubled place. If we can, we’ll find a way to go. Again, we haven’t been. A tiny country on the north coast of the island of Borneo. It is completely bordered and enclosed by Malay Sarawak. You can visit, we just never have. Beautiful Bali. But Indonesia is huge and has so many more places to explore. Indonesia has a lot to offer but Bali will be the most well known destination, particularly for family travellers. Bali is well worth visiting and picturesque Ubud is a firm traveller favourite with many nomads and expats making this mountain town their base for months or years. 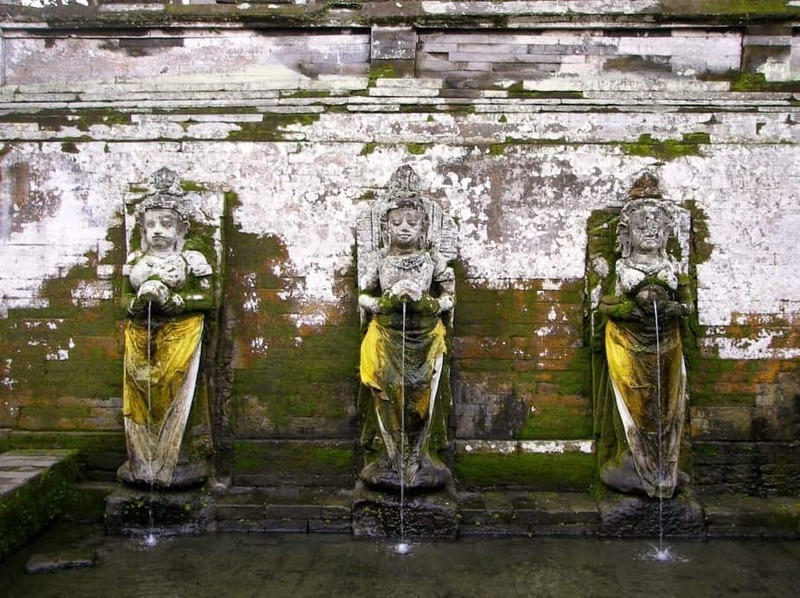 We have a post on things to do around Ubud with kids here. So there we have it. An overview of some of the incredible, amazing places you can share with your kids in South East Asia. We are making you a downloadable, printable pdf, so that if you are planning a family trip to South East Asia, you can circle and star your must visit South East Asian Destinations. Knowing where you’d like to go and where you HAVE to go, is the first part of planning your trip. Getting to Ko Samui from Bangkok and a Scam to Avoid. From Flash to Trash. 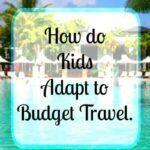 Will Kids Adjust to a Lower Standard of Accommodation? Thailand and Vietnam stand out as the 2 easiest and cheapest countries in our opinion. So many choices! I have been reading your blogs for a little bit now and thank you for the wealth of information! So, my wife and I and two kids (ages 13 and 10) along with my in-laws (approx. 70 yrs) are looking to travel to SE Asia this June for 2 weeks. We’ve travelled much, but not to Asia. We’d like to make the most out of our 2-weeks and are open to focusing on just a few areas for now. I imagine my family and kids with make it back to Asia to continue exploring at some point but this may be my in-laws only Asia trip in their lifetime as they are aging and don’t travel as often. So, with 2-weeks, would you just focus on Thailand this first go around? Certainly Singapore is a draw for too, as I’m in the architecture field and their seems to be so much for us to explore. Maybe it’s just too far from Thailand on this trip – although we’re open to different incoming flights and outbound as we haven’t yet booked our tickets from Colorado. I would limit your flying as much as possible to cut your carbon footprint and just stick to Thailand. 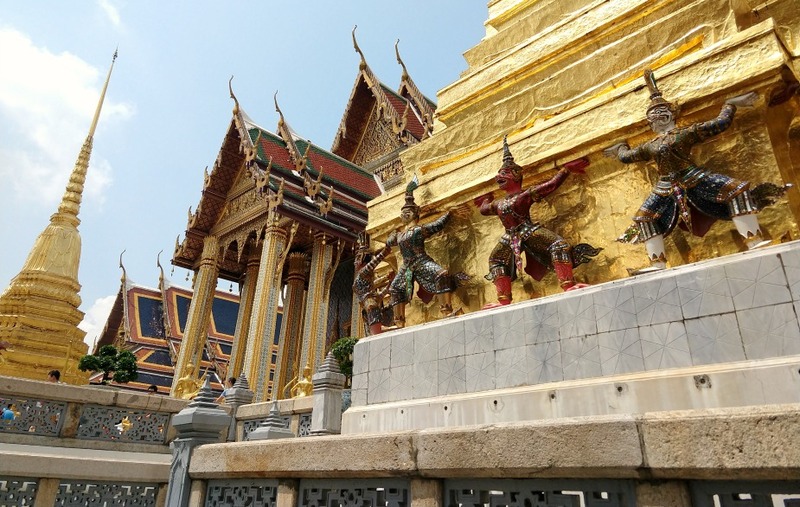 You can only scratch the surface in 2 weeks, and it may be hard on your older travellers, but try to take the bus or train out to at least one of the ancient cities and see everything Bangkok has to offer in terms of the palace, wats, water transport on the Cao Phraya, maybe a trip out to a floating market. You can transfer by bus to Siem Reap for Angkor Wat, but it’s a full day journey each way. If you had more time I’d recommend the bus through Malaysia to Singapore, it’s easy to do, but not in 2 weeks. I think Sukhothai is the most impressive of the ancient cities. If you can get down to the Samut Songkhran area, not far from Bangkok, you can check out Amphawa floating market and see more of Thailand’s rural way of life. Just the above woulf fill 2 weeks I think, but if you want to cram more in take the train up to Chiang Mai and schedule yourselves at least 2-3 days up there to fully appreciate the ancient town. Enjoy your trip! Great advice – thanks a million. Tou could very easily spend your whole 6 weeks in Thailand and have a good explore of the north. It would also be easy to take the land crossing into Loas or the bus into Cambodia. Of course you could also fly. I wouldn’t dp the land crossing through to Vietnam with a 3 year old, I’d fly. 6 weeks isn’t much time to really see 2 countries though. Flying down to KL and seeing a bit of Malaysia could also be a goppd idea, maybe just KL and Penang, the bus to Penang from KL is easy. You could maybe fly into Bangkok and book a return from KL, something like thay. Hi, we’ve been doing short trips (approx2/3 weeks) to SE Asia for the last couple of years from the uk, my husband visits Singapore every year for work so tag along and try to couple this with a trip to another country, so far we’ve seen a fair bit of Malaysia (KL, Penang, Langkawi, Borneo) which we absolutely loved but this year I’m looking for somewhere different as our 2nd country, do you have any suggestions? We love outdoor activities such as trekking, kayaking and walking round cities, but as we don’t have much time we need somewhere where it’s relatively quick to get between destinations. I’ve been following your blog for years but just feel spoilt for choice! Do you have to fly there from Singapore? So you need to be fairly close to an airport? Great info Alyson. Looking at a month to travel this coming July/August. Our kids will be 8 and 9. My wife and I spent a month in Thailand when we took a gap year and want to return and explore Vietnam and Cambodia with our boys. What would you recommend? Angkor Wat stands out but what about a Vietnam? Do you have any itineraries you could share? Any advice or guidance would be fantastic. Did you want to spend a month just in Vietnam Adam ? Or do you have a month total to see as much of SEA as possible ? If the latter- that’s a tough challenge. Tell me exactly what you mean and maybe I can come up with something. We are planning a 2/3 week trip to Southeast Asia. We plan to be there over Christmas this year, We are travelling from the UK. We will be travelling with two daughters ages 11 & 12yrs (eldest will be nearly 13yrs) by the time we go. Unsure on whether to focus 2 weeks on Thailand and then a week somewhere else or the whole 3 weeks there as there is so much to see and do? This all depends on getting holiday approved, if worst case scenario we can only do 2 weeks then we will obviously be in Thailand for the duration. If this is going to be a one off trip, ie. you won’t be returning to South East Asia again, they I’d try to at least squeeze in Angkor Wat. It’s a short trip but will probably take you 3 days with transport. Just fly from Bangkok to Siem Reap, the bus trip will take too much of your time. 3 weeks isn’t enough to even do Thailand justice so you’re going to have to really budget your time and pre-book those buses, trains and planes. No messing about ! Best of luck. Parts of Indonesia are very high on my most loved list. Ubud Bali is wonderful, I could live there. Then there was the snorkelling with manta rays that we did a couple of weeks ago, that was off the scale amazing. We’ll be heading to Komodo island soon, hopefully, lots more to explore. You have a great trip! Thanks for this list! We’ve been traveling mostly around Europe this past year, but are planning to go to SE Asia next. We’ll be newbie parents soon though, so that will be an adventure in itself! Saving this post to help plan our family travels! Ah new parenthood…that’s one giant leap into the unknown. Best of luck! We don’t get involved in voluntourism sorry. It’s difficult to find legitimate places and I really can’t help unfortunately. Must see outside of Thailand and Vietnam, well obviously Angkor Wat. Laos is lovely but no one place would really be a ” must see”, Luang Prabang has the majority of the temples. Myanmar, we haven’t been because of the genocide situation currently. Malaysia, I like the Petronas Towers, Malacca is nice. Singapore it’s Gardens by the Bay, but Singapore is very expensive. Haven’t been to Philippines. Indonesia, you must see some of Bali, it’s lovely- in places. We highly recommend snorkeling with the manta rays off Bali, we did that last week. I want to go to Borobudur and Komodo Island, they’re coming up soon. All of my very favourite places are in Thailand and Vietnam. I think if you want to do just one thing to help, it’s not glamorous, just pick up plastic trash. Don’t create any, get it out of the ocean. It’s a problem. This is what we do. Have a great trip! We are currently planning a 3 week trip to SE Asia with what will be a 4 and 7 year old. Any tips on the must visit places? The list above has a lot of highlights of SE Asia. Your kids are very young, so build in nap times and feed and water them regularly! Food solves a lot of grumpy kid issues, particularly ice cream. In just 3 weeks how many countries do you plan to visit? Which ones? Well if it were me I think I’d just do Bangkok, including palace, wats and a floating market trip(…NOT Dammnoen Sudawak), Chiang Mai, one of the ancient cities of Thailand ( Sukhothai would be my choice but it’s harder to get to) , a beach or island and get over to Cambodia for Angkor Wat ( by air). That’s plenty in 3 weeks. You’d have some big, hot days, so it would take some stamina and organisation to do all that so fast. My son and I set out to do the Palace and Wat Po recently. After the palace we were so hot we went home. There are crowds, queues…you may be better to book a private tour by car than have to do battle with taxis and the queues for the water taxis near the big tourist sites. But make sure you do go on the river, just away from the Palace, Wat Po, Wat Arun scrum. Hi thanks you for all the information on your website. We are planning a 6 month trip March to September 2020 to SE Asia. We would really like to get to know one place really well and use it as a base for any other trips and rent a house there for 5-6 months. Our kids will be 7 and 9 when we go. Is there any one place you would recommend as a base. See our posts on Living in Chiang Mai or in Hoi An. Both are typical ( cheap) long term bases. But you’re massively limiting your explorations by doing it that way. We’ve done it, but only because we’ve been on the road for over 5 years, it was pretty boring being stuck in one place. Even if you only have just a few months you could see a lot more in this region. Hi, we’re currently planning a 6 month world adventure our our girls (7 and 10), which includes 2.5 months in SE Asia. Loving your website and all the helpful advice. We’ve never done anything like this before, so this article is very reassuring that we can do this! Our SE Asia tour will start from Japan, so looking at HK, Vietnam, Cambodia, Laos, Thailand, Malaysia and then possibly Singapore. Which i hope is feasible within the time frame as dont want to be rushing. What do you think? From there we will head to the States/Canada for the last month. Its so difficult choosing as there are so many amazing countries to visit in SEA, but having read the above article it seems like a good route for us first-timers, which we may be able to travel overland or by boat for a lot of it. Looking forward to the pdf and planning our route. Thank you! Hi, I think 6 months is cutting it a bit fine, but of course, it’s possible. You’ll be flying through pretty fast, but for places like Singapore you’ll only need a few days, Hong Kong too I guess ( I’ve not been). It sounds like it’s a very ambitious plan then as we’ve only got 2.5 months in se Asia! We’ve be getting some travel advice on it but now going alone so will definitely cut it down and concentrate on the main places we would want to visit. Was only planning to stop over in HK for a few days. Thanks for your comments., will start planning our itinerary. We’re in the midst of planning a 3months trip to SE Asia with our kids (5 and 6 years old). Your website is a gem and we are using it to start planing our itinerary. Thanks for all this precious info! My pleasure Marie. Enjoy your trip. I’ll have another one out soon on how to get around SEA, bus, plane, boat, train, etc. Sign up!